I’m happy I was able to get this page up for Friday, get ready for a new chapter starting next week, thanks for sticking with me guys, it means a lot. Please tell me the bear will be sticking around. oh thank you, you should make a shirt with that frame of sparticus and Pizzly! I was hoping the same thing when I saw him all sad in the last strip. He made my heart ache with love. About the pizzly staying on. Nevermind the heart-warming moment. I just care bout the bear. Hah! I originally planned on not having the pizzly stay on, ut I’d be a fool to make that move, A FOOL. ah hahahaha, the look on that prizzly is awesome… the whole comic is awesome dude, keep it up! Awesome page. One small critique, though. Where is Scout’s arm?! It’s like he has a floating ghost hand. In panels 2 and 3. Wait how many comics do you actually write/draw? Yay! Scout is getting a new pet to shower with! Sounds good to me. Scouts tattoo-powers are awesome. XD I wish that stuff was real. I’d be turning into a god in a few years. Err… Sorry. That’s the first time I’ve ever done a ‘fanboy’ in a long, long time. Man, I just have to say, I love this comic! It has amazing detail and styling. I anxiously await your new strip every week to see what you have next. The bear can stay!! PLEASE!! I’m picturing the conversation with liz. 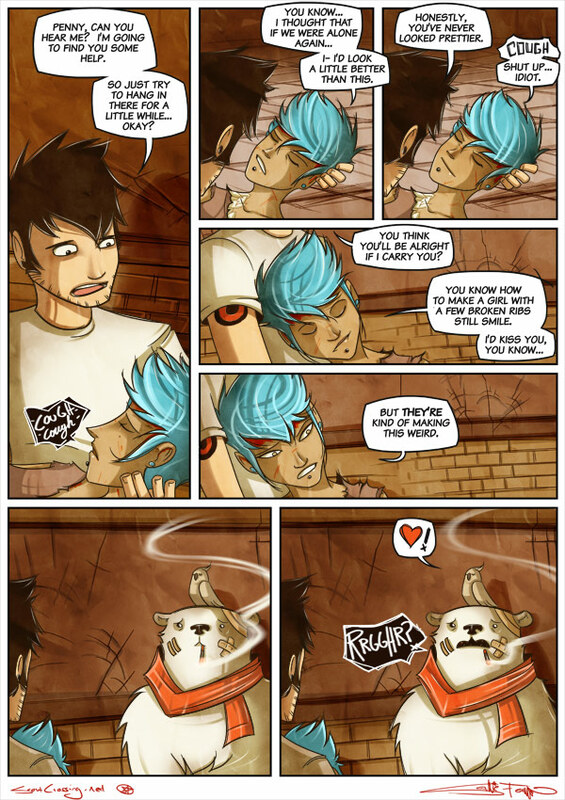 As I am a Scene redhead who is afraid of polar bears I can’t believe I love this comic so much! dude!!!! i want a T Shirt that has those two! Super Bear and Spartacus FTW!!!! Before you know it, they’ll have a band called The Bear and the Bird traveling the country, playing heart-rending love ballads and collecting a motley crew of bad-asses on their way to the top.